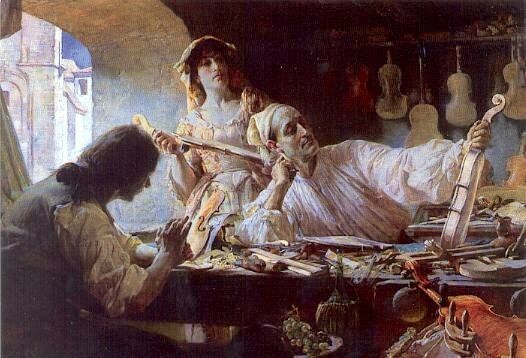 When it comes to the construction of stringed instruments, no artisan has ever come close to achieving the fame of legendary Italian craftsman Antonio Stradivari (1644 – 1737). From the approximately 1,000 instruments he made during his lifetime, 650 (including around 500 violins) survive to this day, better known as Stradivarius or simply Strad. Along with their unique sound, many Strads also carry with them a fascinating history. Like the 1721 “Lady Blunt” violin (sold in 2011 for £9.8 million), named after Lord Byron’s granddaughter Lady Anne Blunt who owned it for 30 years. Or the 1697 “Molitor” Strad, said to once have been owned by Napoleon himself (it belonged to Gabriel Jean Joseph Molitor, a general in the emperor’s army). Given their extraordinary reputation and sky-high value, it is perhaps not surprising that several Strads have gone missing or stolen over the years under obscure circumstances. One such case occurred only last month when Frank Almond, the concertmaster of the Milwaukee Symphony Orchestra, was attacked shortly after a performance by two thieves who disappeared together with his precious Strad. The stolen violin is known as the “Lipinski” Strad and was built in 1715 (which is during Stradivari’s “golden period”, i.e. 1700- 1725). Its first known owner was no other than Italian composer and virtuoso violinist Giuseppe Tartini (1692–1770), whose Devil’s Trill sonata remains hugely popular to this day. Another famous Stradivarius violin with a tumultuous past is the “Gibson” Strad, named after its early owner George Alfred Gibson, a prominent English violinist. On February 28, 1936 it was snatched backstage at Carnegie Hall during a recital by Polish violinist Bronislaw Huberman, who had left the Strad in his dressing room while performing on his -equally precious- Guarnerius (a violin made by Stradivari’s contemporary Giuseppe Guarneri). When Huberman went backstage after the show, his “Gibson” Strad was gone. Some 50 years later and after a deathbed confession by the thief, the “Gibson” Strad was finally recovered and bought by American virtuoso Joshua Bell. Its unique tone can be heard in Romance of the Violin, Bell’s first recording with the long-missing Strad. This entry was posted in Film & Music and tagged classical, Film, Joshua Bell, music, Red Violin, Strad, Stradivarius, Tartini, violin on February 5, 2014 by The Muser.